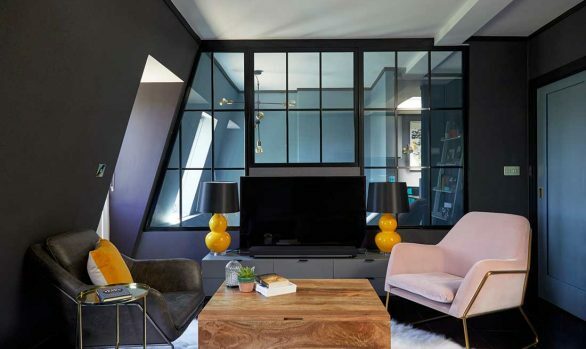 Kia Designs have refurbished a 2 bedroom penthouse in the vibrant heart of Notting Hill. The design transformed an empty shell into an ultra contemporary home that blurs the lines between art and functionality. A boxy corridor, multiple doors and a dark passageway between the kitchen and living room were demolished to create a large open plan space, ideal for entertaining but also allowing the kitchen much needed access to the large windows and surplus light available in the living room. 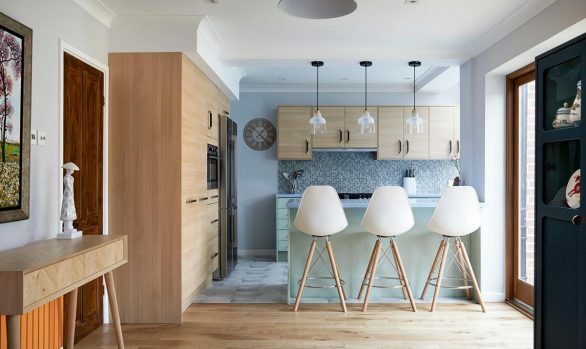 The artistic client required an island for buffet style entertaining, but in essence wanted a kitchen that didn’t look like a kitchen, but added extra “wow factor” to the space and looked at home amongst her striking art pieces. Extra, handleless storage was added to maintain a minimalist look, keeping the lines neat, the focus on the art and the area free of clutter. The rounded Corian table top helped soften the sharp lines and the under cabinet lighting lifts the space and floods light into every corner. Double doors to the room provide the requisite “wow” unveil. The ultra modern design continues in the master bedroom. The floating bed is both futuristic and playful, whilst creating an airy and open look. 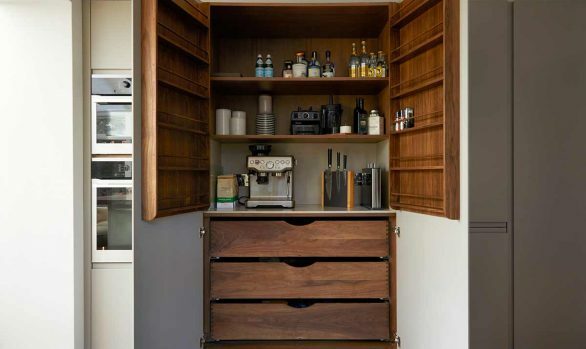 The asymmetry and unpredictability of the cupboards looks right at home alongside the client’s fine art collection and provides ample bedroom storage. 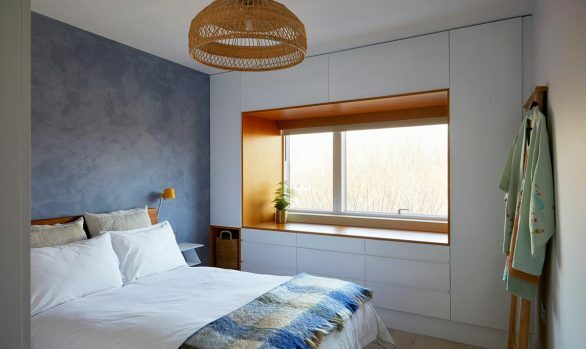 The minimalist nature of the room and the use of cool colour tones keep the space restful and tranquil, worlds away from the colour and excitement outside the front door. More warmth has been injected into the bathroom. Whilst the room is also bathed in clean, pure light, an overall feeling of warmth is created by the blue/grey floor tiles being reflected by the white gold mosaic stones. 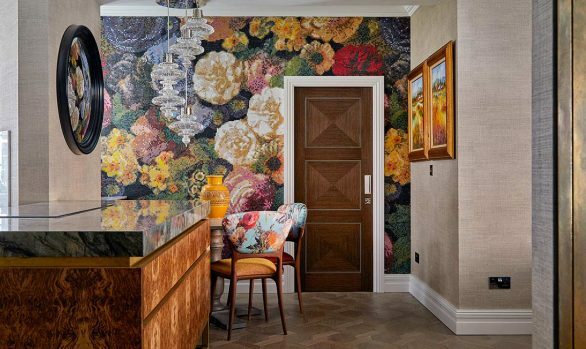 The subtly patterned wall adds interest and sophistication without detracting from the soothing nature of the space, or competing with any feature art. The gallery along the stairwell is a sly nod to the cutting edge galleries along Portobello Road and to the area’s history and ties to top photographers and fashionable residents. The photos themselves inject a sense of the client and her family, that compliments, rather than competes with the other pieces throughout the flat. As the first thing you see when you enter the flat, the display sets the tone for this unique home, where the cutting edge design transforms everyday personal effects into modern installations. Kia Designs offers amazingly wonderful interior design services to homes and offices in a large part of London. Our design services cater to the artistically inclined population of West London. Over the years, our Notting Hill interior design professionals have designed mind-blowing interiors for both new and existing properties. Notting Hill is popular for its Victorian styled buildings and its propensity to promote creativity. Our designers neatly blend traditional style with modern tastes to concoct a magical result. Through the right use of knowledge and aesthetic sense, we have crafted fascinating and appealing designs for you. With our help, you can have an influential presence in one of the most affluent areas of London. If you want an extraordinary look for your kitchen, we can create it. With deep aesthetics, our Notting Hill interior design professionals use the right tiles and flooring to give you a tasteful kitchen. The unique design sense continues in the bedrooms with modern bedding solutions and matching accessories. 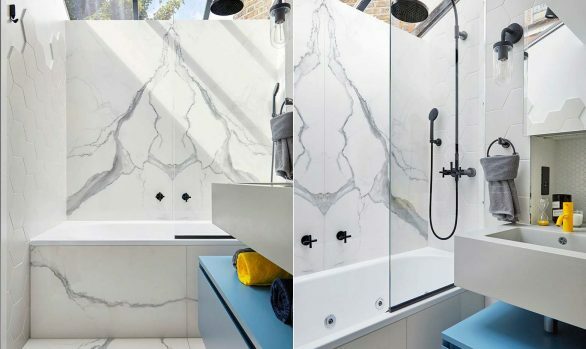 With the major rooms covered, how can your bathroom design stay behind? You can decorate your bathroom with the ideal washbasin, tiles and bathroom vanity combination. Our client-centric approach has made us deliver each project within a given time-frame. With an urge to give full concentration to each project, we take up only 6 projects at a time. Helping you is our target and we have earned fame by offering our helpful services to a wide client base. From negotiation with suppliers and procuring design items to planning the electrical layout of your interiors, you only have to name it and we make it possible. We have solutions to every issue you face.